(Stage 1) » "Prana" is energy, found in everything that moves. Prana flows within us and is part of the space outside us. Pranayama is the regulation of the breath and prana. Pranayama brings serenity and calmness to the mind. The practice soothes the nerves, brings health and vitality to the body, and prepares the mind for meditation and an experience of our own true nature. "Ujayi" means conqueror. In the first stage of this exercise, we learn to observe normal breathing while lying down with our chest open. 1. Fold blankets and lie down with your back supported and chest open. Use another blanket to support the back of your head, tilting your head down slightly. Balance your body evenly without tilting to one side. Close your eyes. 2. Let your legs and arms relax and bring your body into a state of complete stillness. This requires a lot of determined effort as a restless mind makes us fidget and seek diversions. Remain firm in your effort to be still. 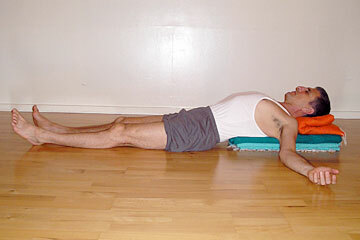 This is Savasana (corpse pose), which we featured last week. Stage I of Ujayi Pranayama entails observing the breath. 3. Now, begin to observe the movement of breathing. Keep your shoulders and arms relaxed and still, and remain observant and alert to the breath. Let your mind become absorbed in each breath. If your mind wanders, train yourself to return to awareness of the flow of breath. Each breath is unique, flowing into and out of existence, never to reoccur. Observe the inhalation with humility and the exhalations with gratitude. 4. Learn to watch the breath without distraction for 10 minutes at a time. After each session, lie flat on the floor and relax for a few minutes (Savasana).